The South Umpqua Historical Society had its fourth quarterly meeting for 2014 at 1:00 p.m. November 2, at the Veteran’s Memorial Building in Tri-City led by Vice President, Roy Brogden. The minutes were approved. The Treasurers report was accepted. Bob Matthews reported that there would be help from 7 Feathers on moving the fence, which will give us more area. After a good potluck, anyone with memories from the past shared their story. What a nice way to end the meeting. As I’ve said before, the DVDs are ready and cost $6, plus $3 for mailing. On November 8, 2014, there was a rededication of the Myrtle Creek Veterans Memorial. It was a wonderful ceremony that brought tears to my eyes. Then in Canyonville on November 11, there was the Veterans Day Celebration that is always good and especially the music from the Glendale Choir with songs from each branch of the service. I love singing along. I wish our young people today knew these service songs. No. 1 – A lean-to for our wagons. No. 2 - A shed next to the Huckleberry Mine building to display more of our mining items. No. 3 - To increase in size our Pickett building. We are all very excited about our Web Site being ready for all of you to view. 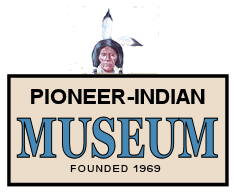 Just go to: www.pioneerindianmuseum.org and you will find us waiting. We want to thank Maureen Butler for all of her work on this project. Maureen is a member of the Myrtle Creek Historical Society and was a driving force in the publication of their ‘Myrtle Creek’ publication and 2014 and 2015 calendar. Thanks so much, Maureen, we couldn’t have done it without you. The Myrtle Creek Historical Society, I’d like to mention the Cow Creek Historical Society in Glendale, they are restoring the Spencer/Martin House. Also, the Douglas County Historical Society, who are housed in the Floed Lane House in Roseburg. 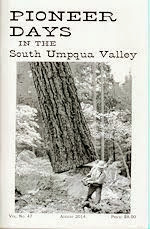 They publish the ‘Umpqua Trapper’ four times a year. This past year they had a good ‘who done it’ about a local doctor and a murder. The year was in 1921, and the story reached far and wide and even made it into a detective magazine. It is good to keep our history alive! Your address will tell you, if it has 15 or LF, you are paid up. There may be a book you’d like to have or a memorial you’d like printed, your membership form has those options. We also want you to know we have youth memberships. 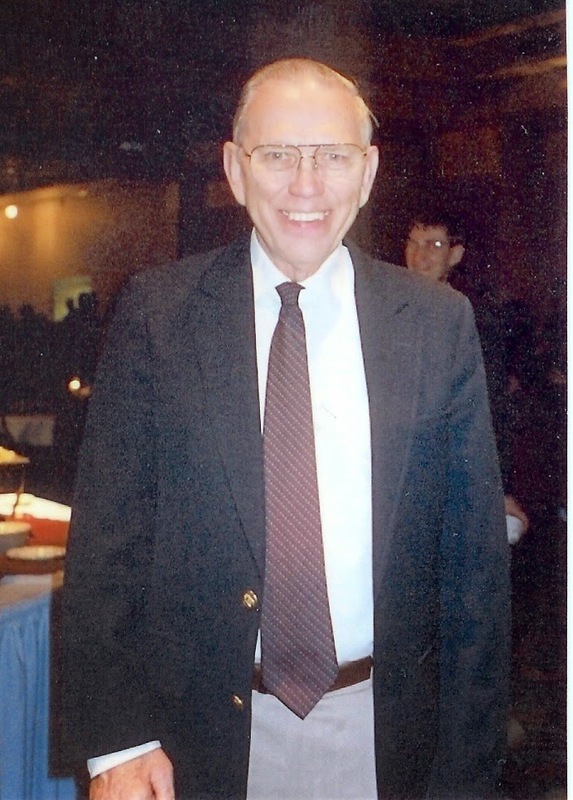 Milt Herbert passed away in December and has left his adopted community for another. But, he has left us such a rich and lasting legacy. Milt, the ‘Mellow Maverick’, was the founder of Herbert Lumber and he thought it would be good if his employees had a bank to cash their checks, so he was co-founder of the South Umpqua Bank or now, Umpqua Bank. Milt was on his way to Northern California to find cheaper timber to cut, when he stopped in Canyonville and I’m guessing he felt much like James Gazley and John Fullerton felt, thinking: This is the place! Herbert’s Pond was the first site of the mill until 1962, when they moved to Riddle to be closer to the railroad. Thank goodness for all these men. Thank you, Milt Herbert, for your service and all you’ve given to the people of Douglas County. He was a gracious man, who did about anything he could to help others. And thank you, Mr. Herbert, for being on the Canyonville School Board that hired me way back in 1963. My new adopted community! YES, you will be home in time for the super bowl! 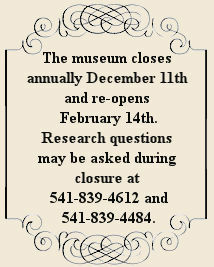 THE MUSEUM WILL OPEN ON WEDNESDAY, FEBRUARY 4 AT 1:00 FOR THE NEW YEAR.